I've always been impressed that John could wade his way through a book like this and find something interesting to say about it. I am not sure I could have managed to finish it. John, and others of my favorite authors like Tim Powers have managed to make some interesting stories using Jungian ideas, but actual Jungians always seem a bit cracked to me. Once upon a time, there was a film producer who said that the kind of movie he liked was one that started with an earthquake and then built to a climax. In a similar spirit, the editor of "Archetype of the Apocalypse" prefaces it with the warning that the "book will challenge the reader to accept a disturbing premise: namely, that *the world as we know it* is coming to an end in the very near future." "Archetype of the Apocalypse" examines most of the "Book of Revelation" verse by verse, but the basis for this prophecy is not the authority of scripture. Rather, the future is proclaimed by the voice of the collective unconscious, as manifested in the culture of the late 20th century and in the psychology of the author's own patients. Objections to this thesis quickly present themselves. For one thing, just once I would like to hear a prophecy about the end of the world as we don't know it. More generally, it is hard to take any school of analytical psychology altogether seriously these days. Nonetheless, I urge readers to suspend their disbelief for a few hours. This is a fascinating little book, filled with provocative observations that transcend theory. 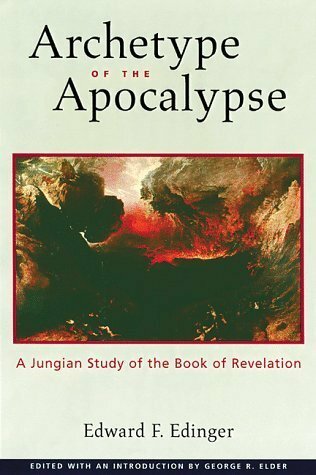 Moreover, aside from the analytical psychology, "Archetype of the Apocalypse" is a surprisingly useful introduction to the parallel apocalyptic texts that pepper the biblical canon and the apocrypha. "The Book of Revelation" is in some ways irreducibly obscure, but even a passing familiarity with its literary allusions makes it much less so. The book's author, Edward F. Edinger, was a noted Jungian analyst and a founder of the C.G. Jung Foundation of New York. The series of lectures that became "Archetype of the Apocalypse" were delivered in 1995. They were edited by George R. Elder, a Jungian-oriented psychotherapist, who worked on the text with Dr. Edinger before the latter's death in 1998. The result is more coherent than are most lecture compilations. Another merit of the book is the use of classic black-and-white illustrations, notably from William Blake and Albrecht Duerer, to help to explicate the biblical text. 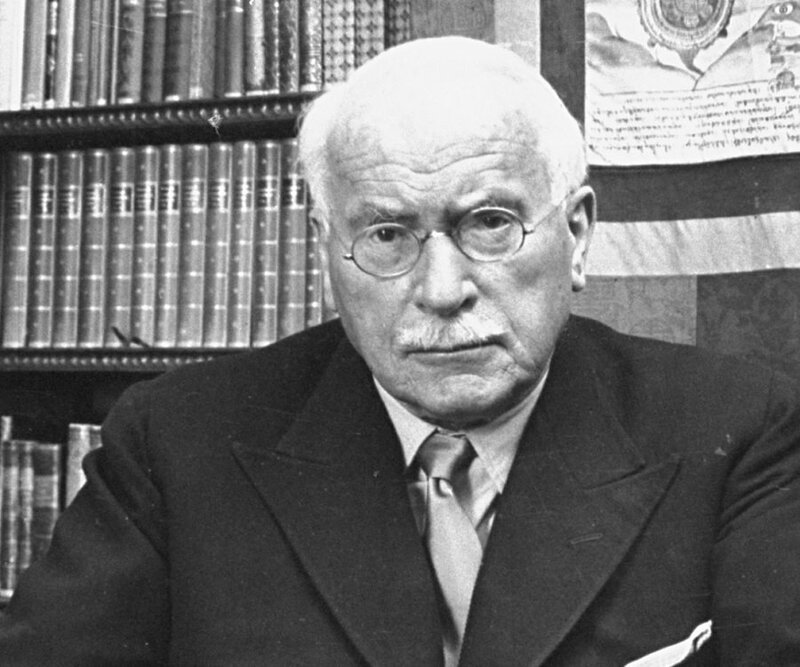 It is not surprising that a follower of Carl Gustav Jung (1875-1961), the famous Swiss depth-psychologist, should take an interest in the notion of the "apocalypse" in general and in the "Book of Revelation" in particular. Jung himself viewed history in much the way Hegel did: it is a process that began in unselfconscious animality, passes through ages of division and strife, and will culminate when mankind finally understands itself and the world. Jung posited that this process was mirrored in the development of the psychology of individuals as they matured through life. The goal of personal psychic development was the integration of the personal, conscious ego with the Self. Jung held that the Self is "transpersonal." It contains an individual's memories, drives and desires, but also, in some way, those of the individual's culture, and even of the human race as a whole. The Self is the repository of Jung's famous "collective unconscious." The purpose of Jungian psychoanalysis is to bring this collective unconscious to consciousness. The patient will then understand himself as he really is, which includes some appreciation of how the Self surpasses the ego's understanding. Jung gave this process of integrating the psyche the name "individuation," but did not claim to have invented it. Cultures throughout history have aided integration by generating symbols, or archetypes, that represent features of the collective unconscious, or stages in the process of individuation. These archetypes are the common possession of the whole species; they are why similar myths appear in distant societies that have never had even indirect contact. A symbol system that particularly interested Jung was alchemy. He believed that the transformations that occurred in the alchemists' alembic, or that they believed to be taking place there, reflected the processes taking place in the alchemists' own psyches. The real goal of alchemy was not to make ordinary gold, but "the philosopher's stone," the symbol of the individuated Self. He also believed that the stages in the alchemical processes corresponded to the great phases in the cultural history of the world. The human race, therefore, went through a pattern of crises and discoveries similar to that experienced by patients undergoing analysis. Jung discussed these topics chiefly in his books "Mysterium Coniunctionis" and "Aion," and Dr. Edinger applies aspects of the analysis in those books here. (There is a brief discussion of Jung's alchemical model of history in my own book, The Perennial Apocalypse.) Another symbol system that reflects the process of individuation is to be found in apocalyptic literature. While writing of this type is not confined to the biblical tradition, it was chiefly biblical apocalyptic literature (literally, the literature of "revelation") that interested Jung. He discussed the matter at length in "Answer to Job." Dr. Edinger insists that "Answer to Job" is of great significance for the future of the world, and so "Archetype of the Apocalypse" is largely a systematic application of insights from that book. For Dr. Edinger, as for the Jungians in general, the personal is the historical. Regarding the notion of the end of the age, he says: "[T]he essential psychological meaning of the Apocalypse [is] the coming into consciousness of the Self -- and anxiety is a harbinger of that phenomenon." While archetypes are, by their nature, ubiquitous in time and space, the fact is that some archetypes are more relevant to some times and places than to others. That was why he delivered these lectures when he did. "I think it is evident to perceptive people," he says, "that the Apocalypse archetype is now highly activated in the collective psyche and is living itself out in human history." "The Self is coming, and the phenomena that ought to be *experienced consciously and integrated by the individual in the course of the individuation process* are occurring unconsciously and collectively in society as a whole." "The Self is projected into one's national community and is the basis of national and ethnic identity....Collective exteriorized manifestations of the Self lead to the constellation of the opposites in the Self; and those opposites generate conflict." "This man represents...a new phenomenon that is quasi-criminal, quasi psychotic due to possession by the archetype of the Apocalypse. And that means, since a human ego has been bypassed, that the possessed individual is functioning `inhumanly.' It is by that very fact a psychological state that generates charisma with tremendous energy in it!" "[T]he vast, collective, individuation process which lies behind history required at the beginning of our era the creation of a powerful `spiritual' counterpole to the `instinctual' degradation and excesses that accompanied the decadence of the ancient world." "[T]he meaning of this double-layered structure is this: at certain levels of development a decisive *separatio* is, in fact, a state of wholeness -- even if not what we, with modern psyches, would define as a state of wholeness." "The image of a totally good God -- albeit pestered by a dissociated evil Satan -- is no longer viable. Instead, the new God-image coming into conscious realization is that of a paradoxical union of opposites; and with it comes a healing of the metaphysical split that has characterized the entire Christian aeon." "Yes, you know, that is the temple we all build on. We don't know the [other people in the dream] because, believe me, they build in India and China and in Russia and all over the world. This is the new religion. You know how long it will take until it is built?...about six hundred years." "God is going to incarnate in humanity as a whole and in that incarnated form offer himself as a self-sacrifice to bring about his own transformation, just as he did with the individual Christ." "By understanding the psychological reality that stands behind them, we are `impoverishing' the scriptures of their content or `relieving' them of the weight of their content...while at the same time augmenting the weight and magnitude of the psyche. That operation is going on in this book." The notion of deliberately "impoverishing the scriptures" will sound a bit diabolical to many readers; certainly it does to me. For that matter, so is Edinger's transpersonal Messianic Age. In fact, I might be outraged by all this, were it not for the fact that true diabolism is beyond the reach of Jung's system. The attempt to reduce religion to collective psychology is not so manifestly foolish as trying to reduce it to, say, neurobiology. Still, it is a form of reductionism nonetheless, an attempt to get a very big thing into a smaller thing. It's not going to work, so there is no point in getting upset about it. Moreover, though the insight is beyond the power of his philosophy to understand, Edinger has succeeded in highlighting the provisional nature of Christian eschatology. In the old formula, the salvation of the world is "already but not yet." This is reflected not least in the text of "Revelation." He is right: the images don't quite gel, however much they may sometimes illuminate history. The notion of a schizophrenic God was one of Jung's poorer notions, and it boobytrapped the whole Jungian enterprise: Jungians are always in danger of confusing the divine with the merely uncanny. On the other hand, history really is both progressive and uncanny, just as Jung imagined it to be. "Archetype of the Apocalypse" illustrates this paradox very well.